A longtime fixture on the Chicago blues scene, Zora Young sounds as if she was born to sing this music. And her fluid, soulful voice isn’t this album’s only calling card. 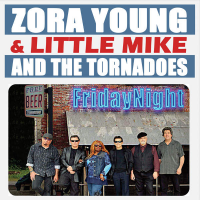 The spotlight shines equally here on the backup by New York-based Little Mike and the Tornadoes, a consummate blues outfit who have been rocking the joint since 1978. Every time you turn around, this CD delivers another killer guitar or piano solo, and the horn section cooks throughout. Mike Markowitz (aka Little Mike) penned four fine tracks here, and the program also includes such chestnuts as “Otis Spann’s “Country Girl” and Howlin’ Wolf’s “44 Blues.” (Fun fact: Young is related to Wolf.) I know this is a lot to say but Chicago blues doesn’t get much better than this.